This site is dedicated to the memory of the 11th (Service) Battalion (Accrington) East Lancashire Regiment, better known as the Accrington Pals. 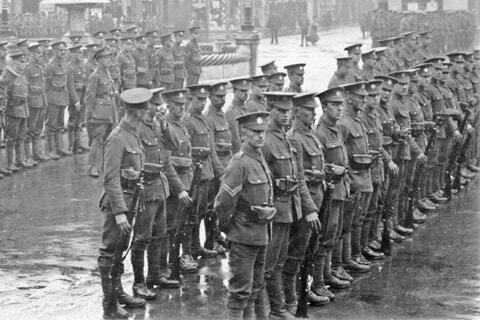 W Company, Accrington Pals, on parade in Castle Square, Caernarvon, 1915. Photograph by kind courtesy of Frances Morris. A month after the outbreak of war, the Accrington Observer & Times of 8th September 1914 reported that the War Office had accepted an offer made by the mayor of Accrington, Captain John Harwood, to raise a complete battalion. When recruitment began on 14th September, 104 men were accepted in the first three hours. Brothers, cousins, friends and workmates enlisted together, and by 24th September the Accrington battalion had all but reached a full strength of 1,100 men. Around half the battalion had been recruited from Accrington and District; the majority of the remainder had been raised in the neighbouring towns of Burnley, Chorley and Blackburn. Some months later, the battalion was to be strengthened by a quarter through the recruitment of a reserve company. Throughout the early months of the battalion's existence the men trained and drilled in and around their home towns. In February 1915 the battalion was given a magnificent send-off as it left Accrington for training at Caernarvon, where Lt-Col. A. W. Rickman of the Northumberland Fusiliers took command. In May 1915, the battalion moved from Caernarvon to Penkridge Bank Camp near Rugeley where it joined the 12th, 13th and 14th Battalions of the York & Lancaster Regiment to form the 94th Brigade, 31st Division. The battalion made further moves in July and September 1915, first to Ripon and then to Hurdcott Camp near Salisbury, before the 31st Division embarked in December for Egypt to counter a Turkish threat against the Suez Canal. In the event, the danger soon receded and, in the last week of February 1916, the 31st Division was ordered to France, to take part in the joint British-French attack on the Somme. In January 1916, the commanders-in-chief of the French and British armies, Joffre and Haig, had reached agreement to mount a joint offensive on the Western Front in the coming summer. Although Haig had argued for an offensive in Flanders, the decision was taken to attack along a wide front at the point where the two armies met close to the Somme river. The choice could hardly have been worse; the chalk-based nature of the ground here had allowed the Germans to construct deep underground shelters, largely untouchable by artillery. North of the Somme river, the German lines ran along the higher ground, protected by dense concentrations of barbed wire and linked by heavily fortified villages and redoubts. Over the coming months, German pressure to the south against the French town of Verdun forced a change in the plans for the offensive. The bulk of the attack was now to be made by the British army on a 15-mile front extending south from Serre to Fricourt, then east to Maricourt on the north bank of the Somme river. The objective of the Pals battalions of 94th Brigade was to capture the hilltop fortress of Serre and form a defensive flank facing north-east and north. The attack was to be led by the 11th East Lancashires on the right and the 12th York & Lancasters (Sheffield City Battalion) on the left. The 13th and 14th York & Lancasters (1st and 2nd Barnsley Pals) were to support the two leading battalions. Against them, Serre was held by the 169th (8th Baden) Infantry Regiment. On 24th June, the British artillery opened a bombardment that was to continue until the morning of the attack. The bombardment was intended to destroy the German defenses completely, but failed to penetrate through to many of the underground shelters and left much of the barbed wire intact. In the early evening of 30th June, the 11th East Lancashires left their camp at Warnimont Wood for an arduous 7 mile trek to the trenches in front of Serre. At 2.40am on Saturday 1st July, the leading companies of the battalion reached the front line trenches to find them already heavily shell-damaged. The build-up had not gone unnoticed and, as daylight broke, the forward lines were again pounded by enemy shellfire. At 6.30am, the British artillery commenced its final furious bombardment of the German front line. At 7.20am, Captain Tough led the first of the battalion's four waves 100 yds into the nightmare of No Man's Land under the cover of artillery and mortar fire. A few minutes later, the second wave followed led by Captain Livesey. As shells continued to burst on the German front trench, the men of the 3rd and 4th Companies IR169 scrambled from their underground shelters bringing machine guns, rifles and grenades to bear on the attacking troops. At 7.30am, the bombardment was lifted from the German front line and the leading waves rose and walked in line towards the German positions. Machine gun- and rifle fire immediately tore into the advancing lines of infantry. One British observer likened the lines of dead to "swathes of cut corn at harvest time". Incredible as it now seems, groups of Pals defied the machine gun fire, threaded their way through the barbed wire and dropped into the German front line. On their left, some of the 12th York & Lancasters also fought their way through. All was in vain. Behind, the third and fourth waves suffered dreadful losses before even reaching No Man's Land. The leading companies of the 13th York & Lancasters were cut down in turn. Some of the Pals - their officers killed or wounded - pressed on towards Serre, never to be seen again. The remaining survivors in the German front line - bereft of reinforcements - were forced to withdraw. By 8am, the battle for Serre was effectively over. "The History of the East Lancashire Regiment in the Great War" records that out of some 720 Accrington Pals who took part in the attack, 584 were killed, wounded or missing. On the first day of the Battle of the Somme, significant inroads into the German positions were made only where the terrain was less favourable to the defenders nearer the Somme river. British casualties on this day alone totalled 60,000. On reading the pages of the Accrington Observer & Times for the months of July and August 1916, the impact the disaster had on the town is all too clear. The initial accounts of success on the Somme, including an erroneous report of the capture of Serre, soon gave way to pages filled with photographs of the killed, wounded and missing. Few, if any, of the town's population could have been untouched by the tragedy. 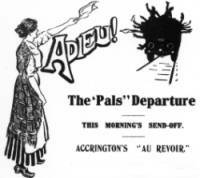 Percy Holmes, the brother of an original Pal, recalled "I remember when the news came through to Accrington that the Pals had been wiped out. I don't think there was a street in Accrington and district that didn't have their blinds drawn, and the bell at Christ Church tolled all the day." The Battle of the Somme was to continue through the months of 1916 until winter brought fighting to a standstill. Serre itself was to remain in German hands until February 1917. The bare facts tell of a few miles of ground being won at a staggering cost of 610,000 British and French casualties. German losses may well have been even greater. The contribution of the battle towards ultimate Allied victory in 1918 is still debated today. The German commander Ludendorff however wrote that on the Somme "the German Army had been fought to a standstill and was utterly worn out". Although the Pals character of the 11th East Lancashires had been destroyed in front of Serre, the battalion was returned to strength and went on to fight through to the end of the war. It took part in successful offensive actions on 28th June 1917 at Oppy-Gavrelle (Battle of Arras), on 28th June 1918 at La Becque, and on 28th September 1918 at Ploegsteert Wood. During the great German Spring Offensive of 1918, the battalion distinguished itself in defensive roles on 27th March at Ayette and on 12th-13th April at the Lys (Hazebrouck). On-line copy of William Turner's "In Memory of our Baxenden Lads". Includes short biographies of three Accrington Pals: L/Cpl. Percy Bury, Pte. Ernest Kenyon and Sgt. Walter Counsell Todd. Accrington Pals on CLEO (Cumbria Lancashire Education Online), an Internet based learning community for Lancashire and Cumbria's teachers, pupils, parents and others. Those interested in the battlefields of the Somme and Vimy as they are today might like to read an account of recent visits.